 All original photos on this web site are Copyright (c) Skip's 4x4. The purpose of publishing these photos is to allow visitors of this web site to view them on-line whilst browsing this web site. These photos may not be used in any other way, including copying, emailing, publishing, printing, posting to forums etc, without express written permission from Skip (me!). All non-original photos published on this web site are only published once Skip is reasonably sure that the photos are not copyright to any individual or firm. If an individual or firm claims that a photo is copyright to them therefore should not have been published on this web site, then Skip guarantees to to fix the problem without delay, and offers his apologies. The copyright owner will be given a choice of how the problem is fixed, being either modifying the web page to include acknowledgement of the copyright owner, or complete removal of the photos. As you know, the internet is full of photos being distributed via emails, forums, web pages etc, and it is very difficult to make decisions regarding what can and can't be published. I will always try to do the right thing whilst running this web site, and so I invite you to email me if you have any questions. This page was last updated on 9 Oct 2003.